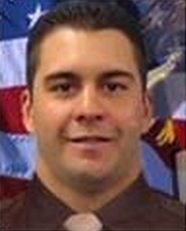 Sergeant Henry Prendes was shot and killed after responding to a domestic violence call. Sergeant Prendes approached the door of the home when the suspect opened fire with a semi-automatic rifle, striking him. Sergeant Prendes fell on the sidewalk, but officers could not reach him because the suspect continued firing with his weapon. The suspect fired approximately 50 rounds and kept the officers pinned behind cars and walls. The suspect then went upstairs and fired down upon the officers. Despite the barrage of gunfire, police officers tried to rescue Sergeant Prendes. A member of Gang Unit heard the call and responded to the scene with a rifle. He was able to shoot and kill the suspect and help rescue Sergeant Prendes. That officer was wounded in the leg during the rescue and exchange of gunfire. Sergeant Prendes had served with the Las Vegas Metropolitan Police Department for 14 years. He is survived by his wife and two young daughters.